Hamilton Home Equity Loan approvals are easy at Axcess Mortgage and Loans Financing Co. Ltd.
At Axcess Mortgage and Loans Financing Co. Ltd., we take the red tape out of the mortgage approval process. Visit EQUITY NO STRESS TEST HOME LOAN to qualify for 20% more money at low interest rates. Click on EQUITY SELF EMPLOYED MORTGAGE for solutions even if you can't prove income on CRA tax returns. Go to EQUITY BAD CREDIt MORTGAGE to learn how our lenders help if you have enough home equity and can make monthly payments. This equity mortgage is your best deal at 80% of appraised value. You can get more money with NO STRESS TEST Hamilton home equity loan approvals to buy a home with 20% down, refinance home mortgage or consolidate debt up to 80% of home value. Banks add a 2% STRESS TEST to your mortgage qualifying interest rate - this reduces the amount of money you will get by a hefty 20%. We have non-bank lenders offering NO STRESS TEST MORTGAGES. To qualify, you need good credit and income. 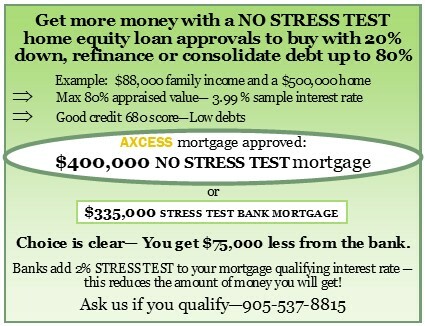 You can get up to 20% more money with a NO STRESS TEST MORTGAGE in Ontario. You're a small business owner -- you work hard and you want the home you deserve. 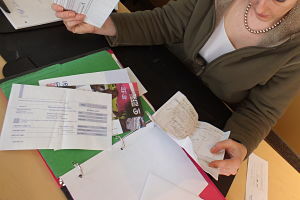 You pay your bills on time, your credit is good, but you're short on income on your tax returns to qualify - but, your bank turns you down for a mortgage. Sound familiar? You deserve a lender who knows you're an "A" client even though your income is hard to prove. We know who these lenders are. Even if you can't qualify for a bank mortgage,or you have credit problems we have alternative mortgage lenders who understand your needs. We'll get you self employed home loans custom made just for you. 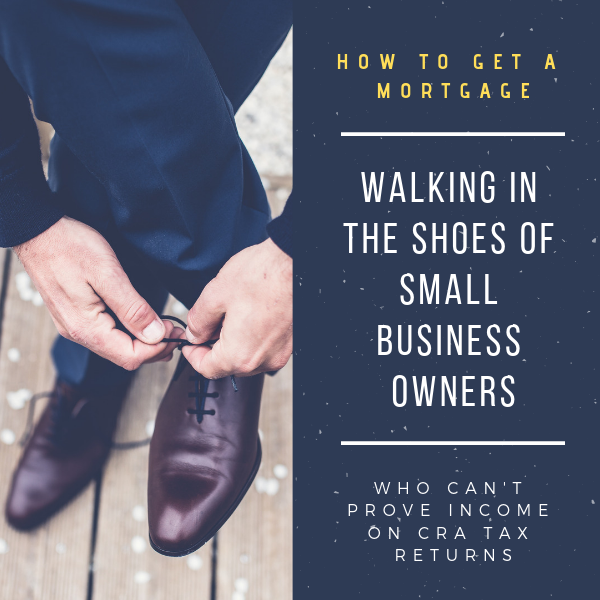 Yes you can get a small business owner mortgage even if you can't prove income on your CRA tax returns. Do you have poor credit and want to buy a house or refinance home mortgage but the bank turned you down ? You are not alone. But, there is alternative mortgage financing available to help you if you have equity in your home and can show that you can make the mortgage payments. Credit problems help with Hamilton Home Equity Loan Approvals. You're recovering from a consumer proposal or bankruptcy... whatever you need, you've come to the right place. Even if you have credit problems, one conversation with me will make a huge difference in the strength of your application - you wont have to worry whether or not your application was packaged correctly and sent to a right lender for a fast approval. Buy a second property and more. In addition to banks banks, credit unions, mortgage and insurance companies for good credit applications, we deal with alternative and private mortgage lenders throughout Ontario. If the banks turned you down for a mortgage - no problem. We have "B" business alternative mortgage lenders and private lenders that say YES to house equity loans. 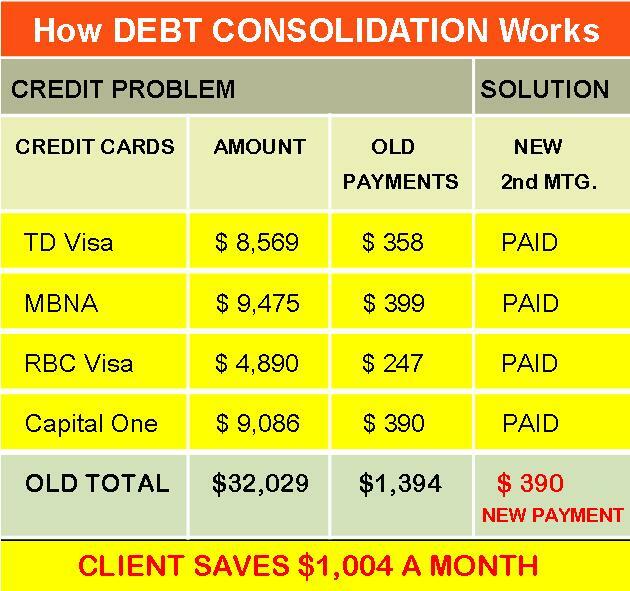 You can consolidate expensive debt, improve your monthly cash flow and STOP CREDITORS' CALLS. We'll get you Hamilton home equity loan approvals in Ontario, even if you have bad credit, provided there is enough equity in your home, your property is marketable and you have the ability to make mortgage payments. You'll get consolidation credit debt help to give you breathing room and a fresh start. Take a look at the chart on the right -- debt consolidate helped our clients save $1,004 each month improving their cash flow and credit. Clients often ask me about getting a second mortgage after a consumer proposal. The answer is YES you can, provided there is enough equity in your home and you can make mortgage payments. Why use a Mortgage Broker for Hamilton home equity loan approvals? We work for you not to the banks to ensure you get the best mortgage available in your situation, even if you have credit problems. We're Hamilton Mortgage Brokers assisting clients throughout Ontario. Knowledge and experience counts. We've been giving clients a financial edge since 1996. Read about mortgage broker and decide for yourself. Many call themselves mortgage brokers but they are NOT -- only few are properly qualified to give you that financial edge. What's it take to qualify for a mortgage ? Take a look at some tips. Alternative mortgage financing is for you if you have credit problems or are a small business owner and can't prove income on your tax returns. Good for rentals too. Your mortgage is in arrears ? What to do. What not to do. Self employed loans no proof of income with good or bad credit. Top debt consolidation loans end credit card debt. Bad credit debt help to give you a fresh start. Second mortgages when the banks won't help. Why use a mortgage broker ? We work for you not the banks. Hamilton home equity loan approvals are fast and easy with Axcess Mortgage. Share this information with your friends who may need mortgage refinancing help. Use the easy social media buttons to share.